The active participation of staff from the outset of any health service or practice improvement process ensures they are more likely to become engaged in the implementation phases that follow initial service analyses. Graphic facilitation is a way of getting participants to develop an understanding of complex systems and articulate solutions from within them. 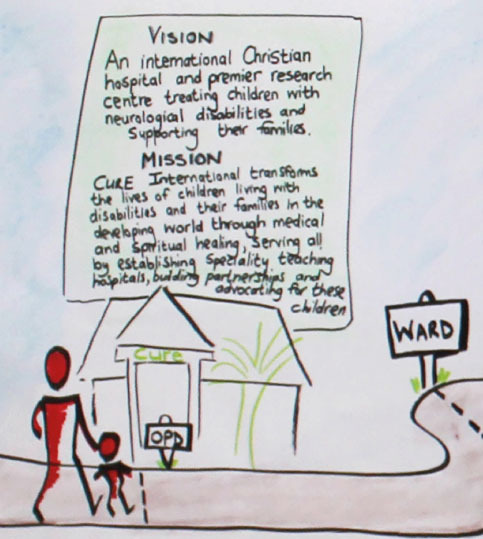 This article describes how a graphic facilitation process enabled the members of a multidisciplinary team at a specialist paediatric neurosurgery hospital in Uganda to understand how their system worked. The large graphic representation the team created helped each team member to visualise their day-to-day practice, understand each person’s contribution, celebrate their triumphs and highlight opportunities for service improvement. The process highlighted three features of their practice: an authentic interdisciplinary team approach to care, admission of the primary carer with the child, and previously unrecognised delays in patient flow through the outpatients department. The team’s active participation and ownership of the process resulted in sustainable improvements to clinical practice. THE HEALTHCARE community continues to seek ways to improve patient care. While many well-documented activities have resulted in quality improvement and cost reduction, identifying the best activity in a specific setting, and enrolling clinicians and others in the healthcare community, are valuable first steps in the process (Institute for Healthcare Improvement 2003). In any practice development intervention, wide participation from the outset is crucial. When planning a practice development process at a specialist children’s neurosurgery hospital in Uganda, the process design was intentionally participative. The process involved graphic facilitation, a method that the authors have been fine-tuning for inclusiveness and collaboration with nurses and other team members in various clinical settings. This article aims to describe graphic facilitation involving a multidisciplinary hospital staff team in the service assessment phase of a practice development process. The process helped the team to articulate service process complexities and unexpected contributors in their system, as well as to identify opportunities to increase effectiveness in service delivery. Graphic facilitation was initially described as an organisational development tool for engaging members of large organisations to establish shared visions and goal statements to make workplaces more efficient (Sibbet 2001). It is an interactive style of promoting group discussion using large graphic representations in which the data produced are simultaneously being consolidated with participants (Bailey 2011, Winkel and Junge 2012). While graphic facilitation has been successful in organisational and business development, little has been written about it in healthcare systems, which is surprising considering how graphic facilitation can make organisations more efficient. Improving quality and changing workplace cultures are at the heart of the practice development work that began in the UK in the 1980s and has become a global movement (McCormack 2010). Practice development is a continuous process of improvement in which healthcare teams are assisted in developing their knowledge and skills, and to transform the culture and context of care (Manley et al 2008). Healthcare staff should be actively enrolled in finding solutions to challenges in their practice. In essence, the value of practice development is linked to its facilitative approach, in which participants are engaged through collaboration, teamwork and partnership building (McSherry and Bassett 2002, McSherry and Warr 2006). Unsworth (2000) described the attributes of practice development as: ‘new ways of working that lead to direct measurable improvement in care … changes which occur as a response to a specific need or problem; that lead to the development of service’. Practice development should empower individuals and teams to understand what they do and how to improve patient care (Manley 2000, Manley and McCormack 2003). These characteristics make graphic facilitation a valuable method in practice development with children’s nurses. It is an engaging and interactive tool that works well to enrol varied groups of hospital staff, including administrative and support staff. Its use in an African specialist paediatric neurosurgery hospital adds additional interest. CURE Children’s Hospital of Uganda (CCHU) is a specialist paediatric neurosurgical teaching hospital providing treatment, care and rehabilitation for a range of children with neurosurgical conditions. The hospital has 39 beds, including a nine-bed paediatric intensive care unit (PICU), and treats on average 4,900 children each year. The average length of stay is five days. It is staffed by a team of 114 clinical, administrative and support staff. In 2016-17, a total of 1,167 surgeries were performed at the hospital (CCHU 2017). A programme alumna of the Child Nurse Practice Development Initiative based in the department of paediatrics and child health at the University of Cape Town, South Africa, returned to Uganda after three years working with the initiative. The initiative’s goal is to promote best possible outcomes for children by finding local solutions from research-based evidence. Motivated by the benefits of examining practice to encourage change, she invited colleagues from Cape Town to assist with a facility-wide practice development process. The process design had to be participative so a varied staff team could articulate their shared practice and identify activities or new ways of working that would lead its development. Graphic facilitation was the core method. The design needed to occur in real time and in a real service setting with providers. A facilitator led the discussion by asking questions, guided by the group purpose of reaching a consensus on how services were being delivered and then on how efficiencies could be made. A recorder captured the discussion and participants’ viewpoints in real time using simple images, words and phrases, a process described in the field of organisational development (Crane 1993, Valenza and Adkins 2009). The co-creation of a visual graphic gave a clear picture of a complex situation (Ball 1999). The graphic anchored discussions without losing the setting’s unique context and allowed multiple perspectives to be captured. As described by others (Ball 1999, Lundberg and Arvola 2007), this group was energised by the co-creation of the evolving graphic. Seeing their ideas recorded resulted in complete ownership and acceptance of the end graphic as a representation of their practice, confirming results described by Crane (1993) in earlier work on the method. The team chose the pathway of care as the organising theme for the discussion and the resulting graphic (Figure 1). We have defined a pathway of care as the route, or course, that a child takes through a component of the healthcare system and used it as an organising theme, and as a unit of analysis in previous observations and interventions. It is a useful alternative to watching what one clinician does and helps to paint a better picture of what is happening around the child as they progress through the health system. Visualising care as a pathway has helped staff to describe what happens in their practice settings and, as different members share their contribution to the child’s journey, a bigger picture of what happens in day to day practice begins to emerge. The pathway of care at CCHU illustrated patient flow, as well as the roles and contributions of care providers. The aim of the practice development process was to make practice visible through graphic facilitation while assisting the CCHU team to identify opportunities for practice improvement. The assistant nurse manager invited all staff members at CCHU to participate in the practice development process. Although it was not considered research, the institutional review board at CCHU approved the project and it was supported by the executive director. As staff would be participating voluntarily, the executive director made arrangements for alternative patient care. Group discussions were led by the two nurse facilitators and included 47 nurses, doctors, social workers, physiotherapists, pastoral workers, the cook and additional support staff. » How does a child move through the hospital? » Who does the child encounter en route? » What happens at each encounter? » How and what do people communicate? » How are parents involved in care? A clear pathway of care emerged from the visual graphic. The pathway began with children arriving at the hospital’s outpatient department before being transferred to the ward and settled before surgery. The pathway we tracked with this team ended with children being stabilised in the PICU after their operations and then being transferred back to the ward before discharge home. How the children moved through the hospital, who they saw, and the elements of treatment, care or rehabilitation on each part of the pathway were made clear in the graphic. The co-construction of the graphic enhanced the discussion by enabling the team to engage and ‘unpack’ their practice. The images and metaphors used to describe the context of the care pathway were culture- and region-specific, and the participants’ enjoyment in seeing their story unfold was gratifying. » An authentic interdisciplinary team approach to care. » A child is always admitted with a primary carer, usually their mother. » Delays in patient flow through the outpatients department. Using colours in the graphic to represent the involvement of different members of the multidisciplinary team (MDT) in the pathway highlights the contribution of each team member to a child’s care. It also assisted in joint understanding and elicited some surprise in the MDT about the work done by other members. The graphic displayed to all participants how the practice of nurses, doctors, and the clerical and family support team co-contributed to ensuring each child reached surgery. The facilitation method and resultant graphic illustrates parity between team members, which the Relationships Foundation describes as the condition in which each member has equal value but a different responsibility (Schluter 1996). The value of parity is inherent in the facilitation method, and is central to creating a safe space in which all viewpoints are heard and contribute to the emerging graphic. When participants value parity, this sense of safety and openness increases. In the authors’ experience of teams in other local healthcare settings, parity across disciplines is unusual. The graphic also shows that patients would receive the same information on several occasions from different people. The team had been unaware of these discrepancies and have since implemented changes to reduce them. These changes include simplifying written communication on patient documentation and rescheduling ward rounds to accommodate the nursing schedule. At CCHU, nurses contribute to all MDT meetings and ward rounds. The day before each child’s surgery, the charge nurse in the operating theatre accompanies the surgeon on pre-theatre rounds to gather input gained from bedside nurses. Participants described how they always formally admit each child’s primary carer, usually the mother, with the child. This means that the primary carer can maintain the child’s routine in hospital. The only regular, timed ward routines are a doctor’s round and medication rounds; all other routines, including feeding, bathing and sleep, are maintained by the mother. There are no cots in the hospital so mothers and infants sleep together on beds, as they would at home. The resultant graphic shows that welcoming and supporting mothers or carers in their normal routines was a common thread along the pathway. 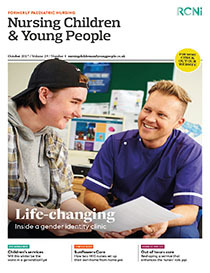 While mothers or relatives often provide care to children and others in hospital settings across the region, the practice of admitting a dyad rather than an individual child is unique to CCHU and affords a level of facility support not encountered in other settings. The visual pathway illustrates contact points between the healthcare team, the carer and child, and the team recognised the need to review an aspect of the arrival process. Initial encounters at the facility had been administrative rather than clinical. An admissions clerk and family support workers initiated the documentation processes and completed initial assessment at admissions in the outpatient department, which meant the patient’s first contact with a nurse was on arrival in the ward. This means there was no triage and clinical deterioration of a newly admitted child was not being detected in a timely way. The MDT had not realised that, as their practice had evolved, this important task had fallen away, and members worked rapidly and collaboratively to improve the outpatient and arrival procedures. A clinical nurse co-ordinator was appointed to aid patient triage from arrival at the facility to ward admission, and this has streamlined patient flow and shortened waiting times in the outpatients department. Graphic facilitation is a novel way to help healthcare workers understand the complexities of service provision in children’s settings. In CCHU, a specialist neurosurgery facility, it enabled the MDT to encourage group discussions, while tracking a child’s pathway of care from arrival to discharge home. The participative practice development process invited input from CCHU’s nurses, doctors and support staff, which made collaboration easier. The resulting graphic enabled the team to visualise their day-to-day practice, understand each other’s contributions, celebrate their triumphs, and highlight opportunities for improving efficiencies and practice development. Graphic facilitation helped to make practice visible at the facility, and invited active participation in, and ownership of, the process that led to sustainable improvements to clinical practice. » Graphic facilitation encourages participation of team members and encourages them to have ownership of the process. » The graphic can help understand a complex health system, illustrate a patient’s journey and identify opportunities for practice involvement. » The process of producing the graphic can help team members visualise day-to-day practice and see the contribution of team members. Bailey N (2011) Graphic facilitation: how it benefits L & D. Training and Development in Australia. 38, 2, 14-15. Crane D (1993) Graphic facilitation. Communications of the ACM - Special Issue Participatory Design. 36, 6, 64-65. Manley K (2000) Organisational culture and consultant nurse outcomes: part 1. Organisational culture. Nursing Standard. 14, 36, 34-38. Manley K , McCormack B (2003) Practice development: purpose, methodology, facilitation and evaluation. Nursing in Critical Care. 8, 1, 22-29. Manley K , McCormack B, Wilson V (Eds) (2008) International Practice Development in Nursing and Healthcare. Wiley-Blackwell, Oxford. McCormack B (2010) Clinical practice development. Journal of Research in Nursing. 15, 2, 189-192. McSherry R , Bassett C (Eds) (2002) Practice Development in the Clinical Setting: A Guide to Implementation. Nelson Thornes, Cheltenham. McSherry R , Warr J (2006) Practice development: confirming the existence of a knowledge and evidence base. Practice Development in Health Care. 5, 2, 55-79. Schluter M (1996) Making relationships a priority for public policy. In Baker N (Ed) Building a Relational Society: New Priorities for Public Policy. Ashgate Publishing, Hants. Unsworth J (2000) Practice development: a concept analysis. Journal of Nursing Management. 8, 6, 317-326. Valenza C , Adkins J (2009) Understanding visual thinking: the history and future of graphic facilitation. Interactions. 16, 4, 38-43. Winkel M , Junge MB (2012) Graphic Facilitation & Art Therapy: Imagery and Metaphor in Organizational Development. Charles C Thomas, Springfield Ill.
Leonard ,A., Bonaconsa ,C., Ssenyonga ,L., & Coetzee ,M.(2017).Graphic facilitation as a novel approach to practice development.Nursing Children and Young People, 29(8), 42-45.doi:10.7748/ncyp.2017.e869. Leonard ,Angela., Bonaconsa Candice, Ssenyonga Lydia, and Coetzee Minette"Graphic facilitation as a novel approach to practice development"Nursing Children and Young People 29,no.8(2017):42-45doi:10.7748/ncyp.2017.e869. Leonard ,Angela., Candice Bonaconsa , Lydia Ssenyonga , and Minette Coetzee "Graphic facilitation as a novel approach to practice development"Nursing Children and Young People 29.no.8(2017):42-45doi:10.7748/ncyp.2017.e869.